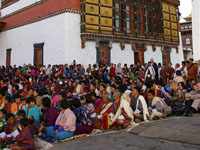 Ngalops : are descendants of Tibetan immigrants who arrived in Bhutan from 9th century and settled in the west of country. Lhotshampas : this Nepalese group, began settling in the south of Bhutan in the late 19th century. The Lhotshampa represents different Nepali speaking ethnic groups primarily – Brahman, Chettri, Gurung, Rai and Limbu.